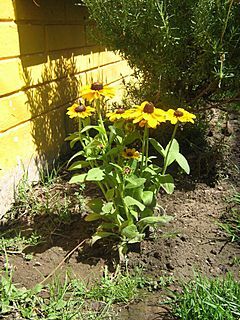 Black-eyed Susan Rudbeckia is one of at least four genera within the flowering plant family Asteraceae whose members are commonly known as coneflowers. Blackeyed Susan is a common Missouri native wildflower which typically occurs in open woods, prairies, fields, roadsides and waste areas throughout the State. The name was given by Carolus Linneaus in honor of his teacher at Uppsala University, Professor Olof Rudbeck the Younger (1660-1740), and his father, Professor Olof Rudbeck the Elder (1630-1702), both of whom were botanists. Black-eyed Susan Facts for Kids. Kiddle Encyclopedia.